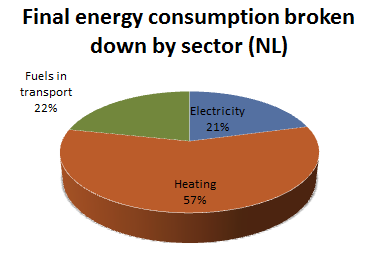 Heating and Cooling is with 58% of the final energy demand the largest energy application in the Netherlands. The main source for heating is natural gas. The Netherlands has a major natural gas source and nearly all houses and industries are connected to the gas network. For the future the aim is to reduce the use of natural gas and increase the use of renewable energy to 14% of the total energy demand in 2020. 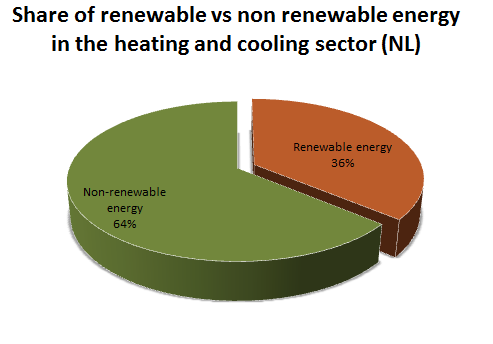 The Government of the Netherlands has launched a Heat Vision in April 2015. The SDE+ scheme is only for larger projects. There is no support for smaller systems. In the Netherlands heat- and cold storage in aquifers (ATES) is a very well developed technology. It is used in many large offices and other large buildings. The application of heat pumps is growing. Johannes van Steenis and Lex Bosselaar are the participants in the project for the Netherlands. Johannes has been involved in several subsidy scheme, wind projects and other renewable energy technologies. Lex Bosselaar has set up the Heating Expertise centre in the Netherlands and he is an expert in the field of solar heating and other heating technologies and heat networks.